Love it or hate it, those behemoth 6"+ phones are here to stay, it seems, and no matter how excellent of a screen-to-body ratio they sport, with that screen diagonal they are proving to be quite problematic in many everyday interactions a typical handset goes through. Samsung opened the floodgates with the gigantic Galaxy Mega 6.3 last spring, then Sony one-upped it with the 6.4" Xperia Z Ultra, and instead of staying rather niche devices, the 6" and above crowd continues unabated for more than a year now. This trend is so entrenched now, that nobody bats an eye when LG's upcoming flagship for the year, the G3, is expected to arrive with a 5.5" display, which would have put it straight in the so-called "phablet" category not so long ago. Speaking of phablets, the phone that warranted the coinage of that term, Samsung's Galaxy Note, featured an "only" 5.3" display when it launched. Today, the phones with 5.5"+ displays are too numerous to list, and phones encroaching on, or surpassing the 6" mark, are appearing left and right from most major manufacturers. Suffice it to mention HTC with its One max, Nokia with the Lumia 1520 and 1320, Sony with the T2 Ultra, Alcatel with the OneTouch Hero, Samsung with the Note 3, or LG with its G Pro 2, all of which have appeared since September. Granted, nothing beats a large screen for web browsing and media consumption, but perusing a 6-incher on a daily basis is proving to be quite challenging, unless you live in Asia, where no screen seems to be too big for the local smartphone fans. We are listing a few situations that most of us encounter on a daily basis with our smartphones, which are getting quite awkward to do with those 6-inchers that are flooding the marketplace recently. Have you had such troubles, or do you think that lugging and using a 6-incher is a minor nuisance compared to the screen real estate gains that come with it? Carrying groceries and getting a call? Walking the dog and trying to answer a quick text message? Driving and trying to key in a new destination in the GPS app? Ok, that last one you aren't supposed to be doing, but you catch our drift - despite the one-handed modes that shrink the keyboard, dialer, calculator, or the whole interface left or right on the display of a big-screen phone, a 6-incher almost always has to be held with two hands for even the simplest of tasks, unless you want to fret all the time about dropping your prrrrecious. It's not only answering or initiating the call that is a challenge on a 6-incher, the good ol' talking on the phone proves to be problematic, too. Vanity considerations about your dorky looks aside, holding the giant slab to your ear is simply exhausting, so those endless chit-chat sessions with your girlfriend, that used to be sweet on the go, are now becoming a torture. A Bluetooth headset is one solution, but it's not always practical in all scenarios. Unless you are in the army, or hunting quail in camo, the simple act of sitting with, or even just carrying around your 6" phone, becomes a pain in the rear, especially if you are sporting less-than-baggy pants. Samsung puts effort in marketing the Note family to women, as they can slip even a tablet in their purse without much trouble. For us poor saps, however, who usually go out only with a phone, keys, and a wallet, carrying such a giant handset around makes you long for those simpler times when you just placed the phone in your pocket, and never remembered it's there until you needed it. As for skinny jeans - forget about it, unless you also want to carry a fanny pack for the ultimate indication that you are tired of living as a male in this cruel, cruel world of sub-6" phones. Have you ever seen people recording a concert with their iPad? Well, you can't just take out the 6-incher, and snap a pic, too - photographic moments require a more careful planning with those phones, as they almost always have to be used with two hands, and held tight while taking a shot. Taking a picture by a 6" phone with one hand is not for the faint of heart, as it's really easy to drop this way, and the sheer weight and size distribution makes it a chore to hold steady. The simple act of picking your phone from the table or the nightstand on the way out is never simple with a 6" handset. The same goes for when the alarm goes off, and you are fumbling around to snooze it in your sleep. Something's bound to be dropped, unless you wake up completely, and grab the situation in your two bare hands. Ok, this one might seem like a stretch, but that's because you drive automatic, while for the rest of the world, the stretch is in your pocket each time you shift gears, or slam on the brakes, not to mention what a chore it is to take out the phone when you receive a call while driving. Just imagine Jason Statham with a G Pro 2 in his left pants pocket here. The solution - put the phone where you can reach it in your car every time you get in, and worry about it slipping under the seat, or simply get one with a manageable size. And just like many Android users found out......they will be fine if it isnt too irritating. One thing in regards to Apple tho....will this eat into sales of iPads, iPad minis? That was always an excuse some Apple fans made about the iPhone staying with a smaller screen. Android users also found out that its much better than Windows Phone, so they're okay. I would reply directly to him but it would be funner to give him a droid. Would you like a droid? I got a verizon one you can use. You might be slightly mentally handicapped. My 5'4 wife has a Note 3 and had a Note 2 before that. She's fine with the size, and hates anything smaller. I'm 5'9, I also have a Note 3 and a Moto G I carry around everyday...IN THE SAME POCKET. Your pants are too small and in the words of Apple, you're doing it wrong. Also there have been multiple studies that have shown no link in cellphone radiation and cancer. You're just grabbing at nothing here to back up your love for tiny phones. Just come on here next time and say "I prefer small phones" and you'll be just fine. Stop making stupid rationalizations. There is no need to insult anybody, specially when it comes to taste.... the mentally & socially handicapped might be you, because he was trying to make a funny comment, and not entirely serious. I am 6' tall and I like compact devices (4.3"~4.7" screen). It is not a physical limitation, nor is my dressing selection. 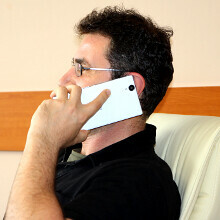 I simply like to handly my phones with one hand easier, and it is also more comfortable to carry. I do not mind working in a small screen, or seeing movies in it, because my first PVP had a 2.2" screen... And also my vision is still pretty good. Agreed. I actually had a LG G2 and sold it because every time I went to sit down I would have to move it around in my pants so it would sit above my leg. In my opinion, that is stupid. 5 inches and under for me. Moto X and Xperia Z1 Compact! Lol there is gonna be a Fast and Furious 7 with Jason Statham. Fast and Furious 7 hasn't come out Genius. See post 36. @ magnaimus Im sorry, before you try to blast someone... you should read your comment and apply it to yourself. @ Miracles I cannot wait. It is bittersweet to see how the story line will change, but I still have so much love for the series! If you're driving, you should just ignore the call!